Enjoy convenient, anytime workouts with the one. Perfect for beginners and advanced fitness enthusiasts alike. Start with a low amount of the strength, and add more as you build muscle. - 14 muscle groups. Boost muscle strength, power, and endurance. Speed post training recovery. -muscle tone and definition. Reduce muscle soreness. Warm up safely. Relax muscles with massage. How to use gel pad? The specific method of using the gel pad please refer the manual P33-34. Since the method of using the gel pad, will effect you to experience for oneself, the best way is refer the manual before using the item. 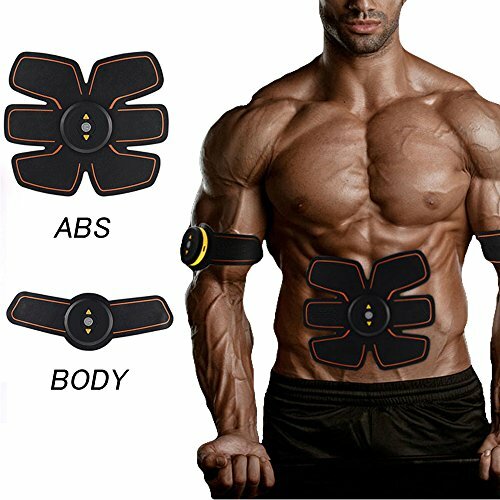 [Efficient Fitness-EMS Technology] You can gain tighter and stronger muscles and perfect figure after consecutive use of this product for 6-8 weeks (about 20 minutes per day, 5 times per week).EMS Technology, EMS (Muscle Stimulation Electrical) technology is through the current stimulation, directly to the signal to muscle, to promote muscle movement. No harm to human body and just let you enjoy scientific and healthy fitness. [Powerful Function] Havenfly-ABS for abdominal muscle training, Havenfly-BODY for body partial exercise. Adopt different levels of intensity from warm-up to high-intensity exercise and finally to relaxation :fat burning, relaxation and exercise. [20 Minutes Per Day] Exercises with 20 minutes equal to 1500M running or Swimming/sit-ups 30 minutes.15 grade force/ 6 modes optional, one key fitness. [Easy to Use] Designed with ergonomics targeting abdominal muscle exercise. Fix the fitness gear to the position where you want to strengthen your muscle. Fitness anywhere/anytime that you want. If you have any questions about this product by Havenfly, contact us by completing and submitting the form below. If you are looking for a specif part number, please include it with your message.